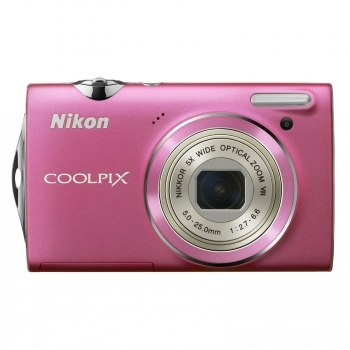 The Nikon Coolpix digital camera is slim beauty that's ready to take on the night in style! The Nikon Coolpix camera has five advanced technologies for beautiful shots, even at night. Plus, with fast start-up time, rapid AF focusing and quick shot-to-shot turnaround time, the COOLPIX keeps you ready at all times to preserve those special moments. A single press of a button of the Nikon Coolpix digital camera lets you begin recording 720p high-definition movies with ease and speed that ensures you capture the moment. Order the Nikon Coolpix digital camera today!